TAOISEACH ENDA KENNY confirmed that he will not be announcing the date of the general election in tonight’s conference speech, saying the date is “immaterial”. Kenny will make his leader’s address tonight at his party’s Ard Fheis in Citywest, but he won’t be ending speculation about when Ireland votes for the 32nd Dáil. “The date of the election actually is immaterial. The date is immaterial, it is the choice that’s important,” he said. The election as I said will be early in the spring, it’s not far away, everybody knows that. But I don’t propose to announce the date this evening. 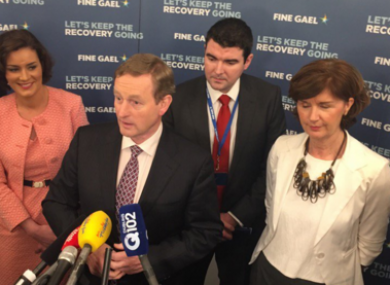 Kenny told reporters that his party is currently holding no discussions with independents about potentially joining Fine Gael in government if it needs the support. There is no discussion taking place between Fine Gael and any independents. I’ve set my stall on this very clear, the proposition of Fine Gael to the people will be to re-elect the Fine Gael/Labour government. The Taoiseach was asked whether independent TD Michael Lowry could possibly be brought into the the fold if a deal was being done with independents. The Taoiseach said that he would not be speculating about the election’s outcome but wouldn’t rule out the option despite being given the opportunity to do so. I am not speculating beyond putting Fine Gael and Labour before the people to ask them for their support. I never presume to discuss the outcomes of elections. Kenny also said that he would serve a full second-term as Taoiseach if he was re-elected, but he would not say whether he would lead his party into the election beyond that. Kenny is due to make his main Ard Fheis speech tonight at 8.30pm. Email “Enda was asked whether he'd work with Michael Lowry, he didn't say no”. Feedback on “Enda was asked whether he'd work with Michael Lowry, he didn't say no”.